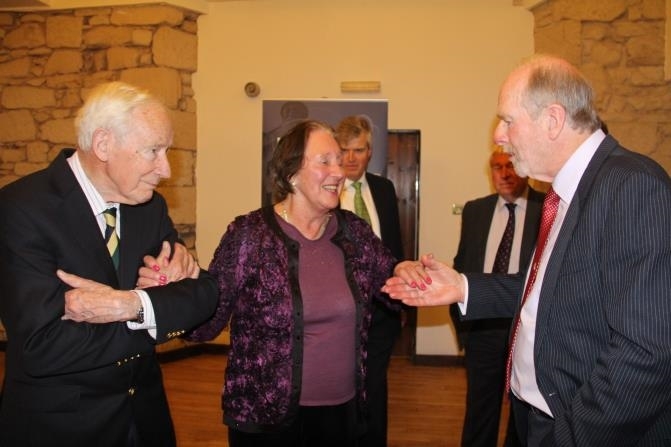 In summer 2016, when Tim Collings (SHE1963-66) met the Headmaster at the Independent Schools Golf Championship final at St Andrew’s, he suggested a regional OA gathering in Scotland. This was a great idea as it had not been done before and reunions have been held much further afield. Robert Lloyd-Taylor (M1980-84) offered to host the event at Broomhall Castle Hotel, a Baronial style mansion near Stirling, which Robert runs with a friend. The date, 28th April 2017, was chosen as it was a bank holiday and an exeat weekend at Aldenham, providing an opportunity for guests to take a short break north of the border, after enjoying an evening with the Headmaster and OAs at this Caledonian gathering. Invitations were sent to all OAs who are known to live north of Manchester and acceptances came in from as far north as Sutherland. The newly elected President of the OA Society travelled up from West Sussex to join the party. Everything went according to plan and Broomhall Castle provided a very warm welcome, a splendid venue and an excellent meal. It was lovely to have a private space to meet friends and make new acquaintances from Aldenham. The School Grace was impressively recited by Tim Collings before dinner, which was very much appreciated by us all. Some guests spent the night in the Castle and after breakfast fond farewells were bid, for Auld Lang Syne! Haste ye back – As a small group of Sixth Formers from Aldenham will be performing at the Edinburgh Fringe in August 2017, there will be another opportunity for a get together in Scotland later this year. The performance will be at Greenside @ Infirmary Street and support from the Aldenham community will be very much appreciated.